On December 10, 2015, at 1903 Pacific standard time, a Bell 407 helicopter, N408FC, was destroyed when it impacted terrain during cruise flight near McFarland, California. 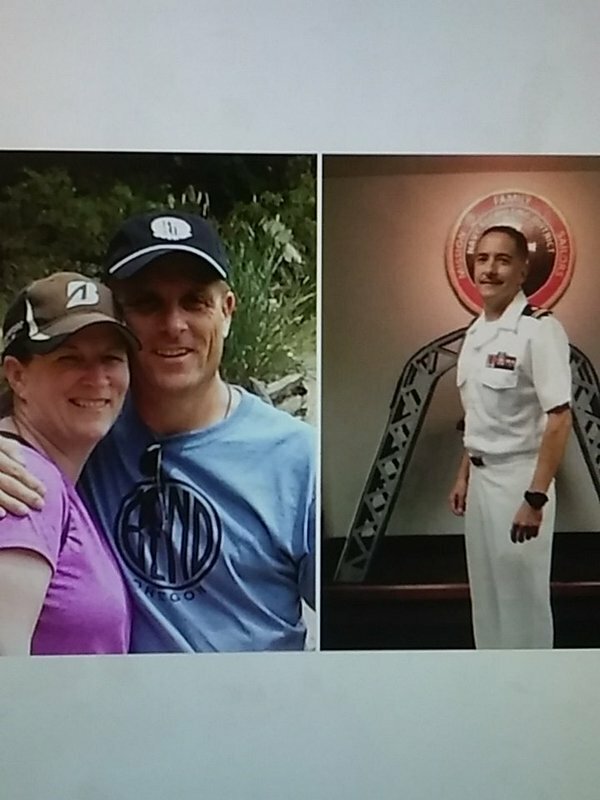 The commercial pilot, flight paramedic, flight nurse, and patient sustained fatal injuries. The helicopter was registered to American Airborne EMS, Fresno, California, and was operated by Rogers Helicopters, Inc., doing business as SkyLife, under the provisions of 14 Code of Federal Regulations Part 135 Air Medical Flight as call sign SkyLife 4. Night visual meteorological conditions prevailed, and a company visual flight rules (VFR) flight plan was filed. The cross-country flight originated from the Porterville Municipal Airport PVT (KPTV) Porterville, California, at 1849 with an intended destination of San Joaquin Community Hospital, Bakersfield, California. Information provided by the helicopter operator, the Federal Aviation Administration (FAA), and local law enforcement officials indicated that the helicopter was initially dispatched from Visalia Municipal Airport (VIS), Visalia, California, to facilitate the transfer of a patient from PVT KPTV to a hospital helipad in Bakersfield. Data recovered from a handheld Garmin GPSMap 396 GPS unit revealed that the helicopter departed from VIS about 1734, arrived at PVT about 1756. The operator's check pilot stated that he talked with the accident pilot via telephone about 1800. During this conversation, the accident pilot told the check pilot that he had just arrived at PVT KPTV and had checked the weather for Bakersfield, noting that visibility of 6 miles had been reported. The check pilot expressed his concern that the weather would be worse in the area than predicted. The accident pilot agreed and stated that he would carefully check the weather for the flight. The flight departed from PVT KPTV at 1849:47. The recorded data showed that the helicopter was on a southerly course, along State Highway 65, and that the helicopter ascended to a GPS altitude of about 1,000 ft for the first 6 minutes 11 seconds of the flight with groundspeeds that varied between 125 mph and 141 mph. Beginning at 1855:58, the helicopter continued along a southerly course and began to ascend, reaching a maximum GPS altitude of 1,554 ft at 1902:43; the groundspeed varied between 124 and 144 mph. Between 1903:08 and 1903:20, the helicopter's GPS altitude decreased from 1,535 to 1,476 ft, and the groundspeed increased from 135 to 138 mph, while the helicopter flew along a magnetic heading of 185°. At 1903:28, the helicopter began a left turn while descending through 1,300 ft at a groundspeed of 141 mph. The last three recorded data points—at 1903:32, 1903:35, and 1903:38—showed that the helicopter continued to descend; the GPS did not indicate a groundspeed for the last data point, which was recorded when the helicopter was about 590 ft southwest of the accident site. 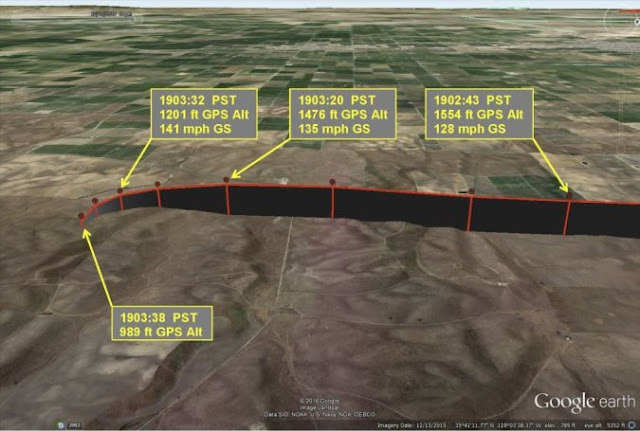 The calculated rate of descent for the last three data points was 2,210 ft per minute. Figure 1 shows the GPS-derived data points between 1902:43 and 1903:38. At 1927, the dispatcher radioed the pilot to determine the flight's status but did not receive a response. The dispatcher contacted personnel at the destination hospital and Meadows Field Airport (BFL), Bakersfield, California, and learned that the flight had not reached the intended destination. An FAA alert notification was issued at 2034, and the helicopter wreckage was located by pilots in a sheriff's office helicopter at 2054. The pilot-in-command of the sheriff's office helicopter reported that, during the search for the accident helicopter, he observed dense ground fog between 200 and 500 ft above ground level and encountered heavy rainfall. Figure 1. Final eight GPS-recorded data points. The pilot, age 49, held a commercial pilot certificate with rotorcraft helicopter and instrument rotorcraft ratings and a flight instructor certificate with rotorcraft helicopter and instrument helicopter ratings. 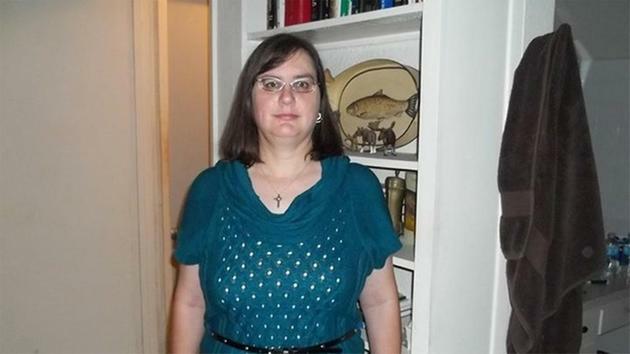 He held a second-class medical certificate dated April 8, 2015, with the limitation "must wear corrective lenses." Company records and the pilot's most recent logbook showed that the pilot was hired on August 15, 2012 and conducted mostly ferry flights and LIDAR utility work in Bell 206 and McDonnell Douglas MD530 and MD500 helicopters. On June 4, 2015, the pilot was reassigned to the Bell 407 with a special training authorization for emergency medical services. Before his employment with Rogers Helicopters, the pilot conducted air tours mostly in the Airbus Helicopters AS350 BA helicopter. According to his most recent logbook, with entries dated from August 27, 2009, to December 10, 2015 the pilot had accumulated 11,415.3 hours of total flight experience, 159.3 hours of which were at night. The logbook also showed that, between August 27, 2009, and the accident date, the pilot had accumulated 17.8 hours of night flight experience; 4 hours of flight in actual instrument conditions; and 55.3 hours of simulated instrument time, including 0.5 hours in the accident helicopter between May 30 and June 4, 2015. Between May 28, 2015, and the accident date, the pilot had accumulated 48.8 hours of total flight experience in the Bell 407, 11.2 hours of which were in the accident helicopter. During this timeframe, he accumulated 15 hours of night flight time, including 2.3 hours in the accident helicopter, which comprised 2 hours of night training that included 0.78 hours of night vision goggle (NVG) training. During the 90 days that preceded the accident, the pilot had accumulated 5.2 hours of night flight time, including 0.3 hours in the accident helicopter 2 days before the accident. A review of FAA records indicated that the pilot had not flown a helicopter equipped with advanced avionics (glass cockpit displays) before his first flight in the accident helicopter. During a postaccident interview, the pilot's wife reported that he expressed numerous concerns about not having NVG. She stated that the pilot had started, but had not yet completed, company NVG training. In addition, she stated that the pilot's night training was limited but that, with his skill level, he was "fine" with night flying; however, he wasn't comfortable flying at night without the use of NVG's. A company pilot also reported that the accident pilot expressed concern about flying near terrain in the area during periods of darkness without the use of NVG's. The accident helicopter, serial number 53450, was configured for helicopter air ambulance (HAA) operations. The FAA type certificate required one flight crewmember (a pilot) and permitted operations under day or night visual flight rules (VFR). The helicopter was equipped with a Garmin G500H glass cockpit system, which was installed in February 2013. As shown in figure 2, the system comprised a Garmin GDU 620 primary flight display and multifunction display, a Garmin GRS 77 attitude heading reference system (AHRS), and a Garmin GDC 74 air data computer. The helicopter also had an analog airspeed indicator and altimeter; however, no additional attitude reference instruments were installed. The helicopter was also configured for the use NVG's. Figure 2. Garmin G500H system similar to that installed in N408FC (the accident helicopter). Obtained from Garmin.Com. The helicopter was powered by a Rolls-Royce model M250-C47B turboshaft engine, serial number CAE-847778, with maximum takeoff and maximum continuous power ratings of 650 and 600 shaft horsepower, respectively. A review of the airframe logbooks showed that the helicopter's most recent annual inspection completed on June 1, 2015, with an airframe total time of 9,017.5 hours. The pilot primarily flew another company Bell 407 helicopter, N101HF, that was also configured for HAA operations. As shown in figure 3, this helicopter had analog instruments and not the advanced avionics installed in the accident helicopter. Figure 3. Analog instruments installed in N101HF. At 1854, the recorded weather conditions at PTV, elevation 443 ft msl, located about 21 nautical miles (nm) north of the accident site, were as follows: wind from 040° at 5 knots, visibility 10 statute miles or greater, light rain, overcast ceiling at 3,300 ft, temperature and dew point of 12°C, and altimeter setting 29.91 inches of mercury. At 1854, the recorded weather conditions at BFL, located about 14 nm south of the accident location, were as follows: wind from 280° at 4 knots, visibility 10 statute miles or greater, ceiling overcast at 6,000 ft, temperature of 14°C, dew point 11°C, and altimeter setting 29.91 inches of mercury. No weather reporting stations were located along the route of flight. 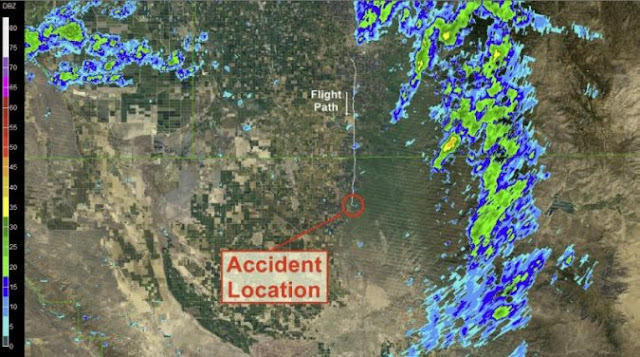 The closest National Weather Service Weather (NWS) Surveillance Radar-1988, Doppler (WSR-88D) was located in the San Joaquin Valley, California, about 47 nm northwest of the accident site. The WSR-88D captured base reflectivity imagery at 1902, as shown in figure 4, which mainly depicted light to moderate values of reflectivity to the east, northeast, north, and northwest of the accident site. Figure 4. WSR-88D base reflectivity imagery. The NWS Weather Forecast Office (WFO) in Hanford, California, issued an area forecast discussion at 1516. It noted areas of marginal visual/instrument conditions with mountain obscurations in clouds and precipitation developing over the Sierra Nevada mountains near Yosemite, California, and spreading south through the day. Airmen's Meteorological Information (AIRMET) advisories for instrument conditions, mountain obscuration, and moderate turbulence were in effect for the accident site at the accident time. A postaccident discussion with meteorologists at the NWS Weather Forecast Office in Hanford indicated that the conditions about the time and near the location of the accident were conducive to fog. The WFO referenced a Twitter post from an individual that observed fog in the area of McFarland, however this Twitter post was unavailable. The NWS meteorologists indicated that ground fog near the accident region is commonly relatively shallow and suggested common depths are 150 to 300 feet agl. For further meteorological information, see the weather study in the public docket for this investigation. The helicopter impacted open, sparsely populated, unlit, hilly terrain about 9 miles east of McFarland. State Highway 65 was located about 0.8 nm west of the accident site. All major structural components of the helicopter were located within the wreckage debris path, which was about 465 ft in length and oriented on a magnetic heading of about 037°. Portions of the main rotor blades, metal fragments, medical equipment, various flight controls, and fuselage components were observed along the debris path. The first identified point of contact (FIPC) was a ground scar, measuring about 2 inches wide by 7 inches long, which was consistent with a main rotor blade strike. Two additional ground scars, consistent with main rotor blade strikes, were located about 12 and 21 ft beyond the FIPC. Adjacent to the 21-ft ground scar was an impact crater that was about 12 inches deep, between about 29 and 54 inches wide, and 5 ft in length. Within the impact crater, portions of a landing skid, fuselage antenna, and a panel from the bottom side of the fuselage were found. About 77 ft from the FIPC, the left skid was located along slightly down-sloping terrain. The lower portion of the left door was located about 126 ft from the FIPC. The right skid was located about 213 ft from the FIPC, and the inboard portion of the yellow main rotor blade was located about 226 ft from the FIPC. The main wreckage and tailboom were located about 260 and 337 ft, respectively, from the FIPC. The fuselage came to rest in an upright position, oriented on a magnetic heading of about 330°. The main rotor head remained attached to the mast, and three of the four main rotor blades remained attached to the rotor hub. The forward portion of the fuselage was torn open, crushed, and twisted. The bottom portion of the fuselage was partially displaced and torn open. The tailboom had separated from the fuselage slightly aft of its aft fuselage attach point. The vertical stabilizer had separated from the tailboom and was located adjacent to the fuselage. 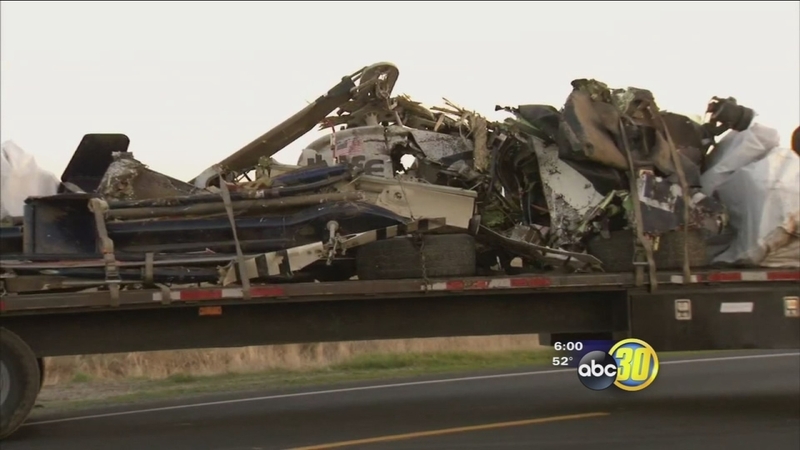 The NTSB examined the recovered wreckage at the facilities of Plain Parts, Pleasant Grove, California. Bell Helicopter, Rolls-Royce, Rogers Helicopters, and the FAA also participated in the examination. The fuselage was mostly fragmented from the bottom of the engine deck structure downward. The forward fuselage exhibited crush damage from the nose to slightly forward of the baggage compartment. The transmission deck and engine pan exhibited significant impact damage and remained attached to the intermediate section of the fuselage. The tailboom was mostly intact. The left-hand finlet on the horizontal stabilizer was fractured, and the right-hand finlet remained attached. The stinger remained attached to the bottom of the vertical stabilizer. The forward fuel cell, which had about 20 to 24 gallons of fuel that was removed before recovery of the airframe, was ruptured along the top of the fuel cell. The aft (main) fuel cell was ruptured with no fuel noted prior to removal of the wreckage. The fuel transfer and fuel boost pumps were damaged from impact. The main rotor hub remained attached to the main rotor mast with the mast nut in place. The yoke displayed fractures near two of the four inner elastomeric shear bearings. The red blade, which had been cut about 12 inches from the hub for wreckage recovery purposes, exhibited fractures outboard of the blade root that spanned about one-third of the blade's length. The green blade also exhibited fractures outboard of the blade root that spanned about one-third of the blade's length. The yellow blade remained attached at the grip with the yoke flexure separated from the main rotor hub. The blue blade remained attached at the grip. All of the main rotor blades exhibited ground impact marks along the leading edges. Continuity was established from the collective and cyclic to the main rotor blades and from the pedals to the tail rotor. Numerous separations were observed throughout the flight control system that were consistent with impact damage. The three-control servos were removed for further examination and functional testing. No evidence was found of any foreign object or wildlife strike on the tail rotor, wind screen, main rotor blades, main rotor mast, or pitch change links. The engine remained attached to the airframe. The N2 system turned freely from the fourth-stage turbine wheel to the power takeoff gear. The N1 system turned freely, and continuity was established from the compressor impeller to the starter generator pad. Several blades from the impeller were bent opposite their direction of travel. The fourth-stage turbine wheel was intact and appeared normal. The bleed valve was fractured from the compressor scroll. Multiple dents were noted on the compressor scroll, discharge tube, and outer combustion case. Neither the upper nor the lower magnetic chip detectors contained magnetic debris. The airframe fuel filter and fuel removed from the filter bowl were free of debris. The fuel tested negative for water. The engine control unit (ECU) was found intact and attached to the airframe. The ECU was removed, and stored data were downloaded. The data showed no faults or anomalies before the accident sequence. The ECU recorded less than one line of operational data, including an NR drop below 92%. 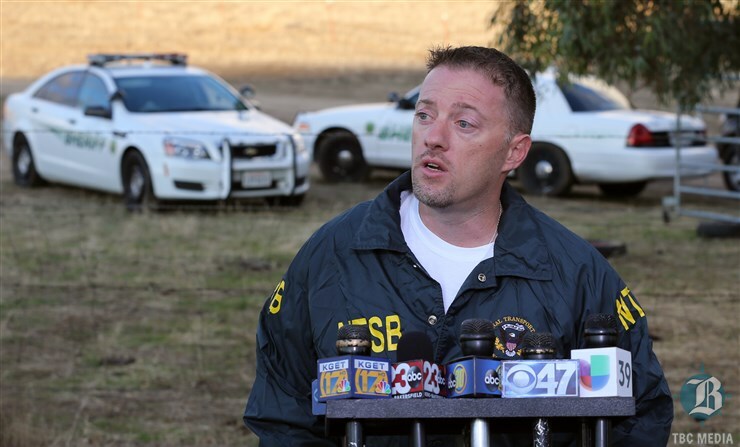 The Kern County Sheriff's Office, Coroner Section, Bakersfield, California, performed an autopsy on the pilot. The autopsy report indicated that the pilot's cause of death was blunt injuries. The FAA's Bioaeronautical Sciences Research Laboratory, Oklahoma City, Oklahoma, performed toxicological tests on specimens recovered from the pilot, which were negative for drugs, ethanol, and carbon monoxide. The engine was further examined at the Rolls-Royce facility in Indianapolis, Indiana under the supervision of the NTSB investigator-in-charge. The lower chip detector exhibited a small sliver of metal. The fuel filter and oil filter were free of debris. N1 and N2 could freely be rotated by hand. N1 exhibited slight interference when rotated due to the displacement of the rubber shroud from the bell mouth inlet into the compressor. All "B" nuts were verified to be at least hand tight. The bleed valve housing was found fractured in a manner consistent with impact. Dirt was observed within the bleed valve, which prevented the valve from being manually moved. Most of the compressor blades were bent opposite from their direction of rotation. A significant amount of dirt was located throughout the engine gas path. The compressor rotor showed evidence of contact with the scroll, which exhibited rotational witness marks. Removal and disassembly of the turbine showed no evidence of any operational failure or malfunction. Ingested dirt was observed throughout the turbine and exhaust. A significant amount of dirt was compressed around the fuel nozzle. The accessory gearbox was intact and unremarkable. The servos were examined at Bell Helicopter's facility in Hurst, Texas, on January 24, 2018. Examination of the three control servos found no pre-accident deficiencies, and each servo passed a functional check. 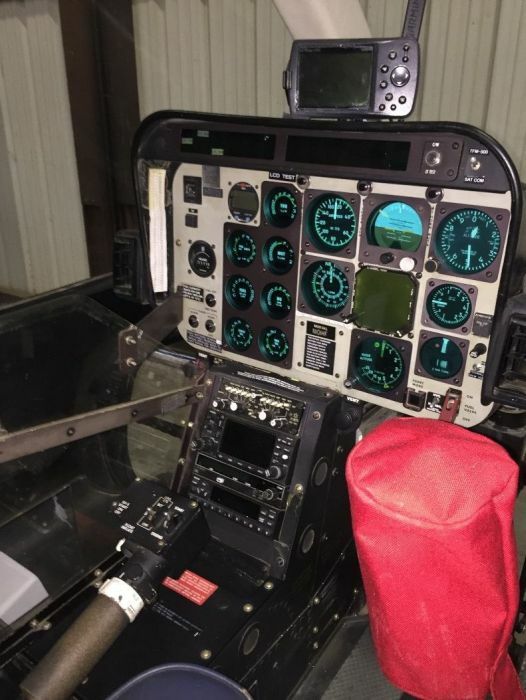 The Garmin GRS 77H AHRS unit and the GDU 620 display unit were removed from the wreckage and were examined at Garmin's facilities in Olathe, Kansas, and Salem, Oregon, respectively, under the NTSB's supervision. Before testing, the GRS 77H unit's assert logs were downloaded. A review of the downloaded logs revealed that one assert entry recorded at 19:03:40, at a location consistent with the accident site. The assert entry indicated that 14.3 minutes after the AHRS was last powered up, the AHRS measured an abrupt and excessive change in the aircraft body roll angular rate. Specifically, within about 0.04 second, the body roll angular rate of the helicopter advanced to a roll rate that exceeded 16 degrees/second, which caused a software-initiated reset of the AHRS. The North, East and Down velocities at the moment the assert was triggered were 53.7, 100.7, and 34.4 knots, respectively. The rate of descent was calculated to be about 3,486 ft per minute at the time of the log entry. The air data computer recorded that the true airspeed at the time was 113.3 knots. The GRS 77H unit underwent functional and motion tests. Overall, the unit performed unremarkably. For detailed information regarding the testing of the GRS 77H, see the System Group Chairman's Factual Report in the public docket for this investigation. Before functional testing of the GDU 620, the recorded assert logs were downloaded, but there were no recorded logs on or about the day of the accident. Functional testing of the GDU 620 was unremarkable. For detailed information regarding the testing of the GDU 620 unit, see the GDU 620 examination reports in the public docket for this investigation. Rogers Helicopters started in 1962 with operations in powerline construction and aerial firefighting. The company began emergency medical services (EMS) operations in 1991. At the time of the accident, Rogers Helicopters was headquartered in Fresno, California, and operated 3 turbine-powered airplanes and 38 turbine-powered helicopters and employed about 55 full- or part-time pilots. For EMS operations, the company operated two Bell 407 helicopters, a Bell 430 helicopter, and a Beech King Air airplane. 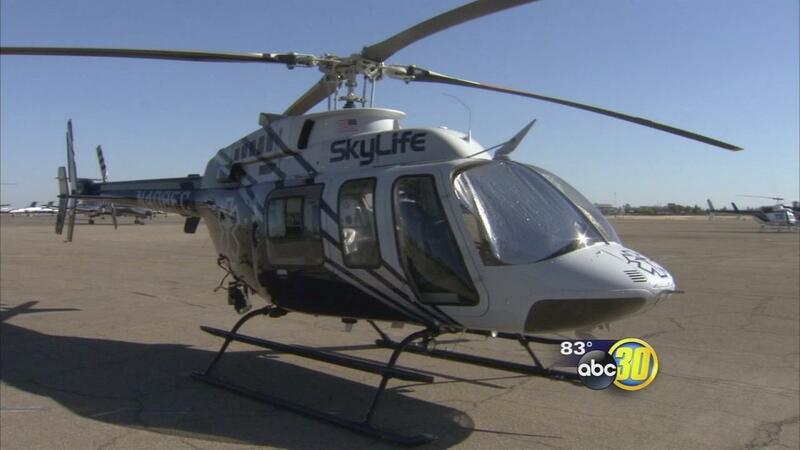 For the accident flight, Rogers Helicopters was doing business as SkyLife. 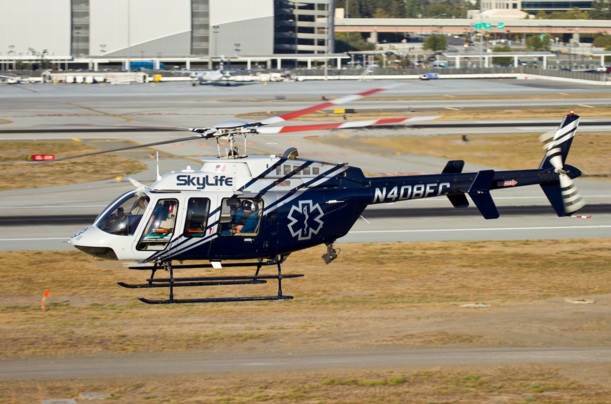 Rogers Helicopters' director of operations reported that SkyLife was a partnership with American Ambulance, with American Ambulance providing the medical crewmembers and equipment and Rogers Helicopters providing the pilot and aircraft. According to SkyLife's SOP Policy and Procedure Manual, the pilot-in-command "is the final authority for safe operations and may elect to not begin or continue a flight should safety be compromised. Additionally, if medical personnel do not feel comfortable during any part of the flight it shall be canceled regardless of existing weather conditions." The manual referred to the company's weather minimums, which were defined in Rogers Helicopters' FAA-approved operations specifications. The weather minimums were also found in Rogers Helicopters' operations manual. Rogers Helicopters' Part 135 Operations Manual outlined weather minimums for nighttime operations for local and cross-country flights. Local flights in VFR conditions required a 500-ft agl ceiling and 2 miles visibility within a 25-nm radius of the company's base. For cross-country operations in VFR conditions, a ceiling of 1,000 ft agl and 3 miles visibility were required for operations outside of a 25-nm radius of the company's base. In addition, the operations manual stated that, "if during flight, unforeseen or unforecasted weather is encountered that is below operating VFR minimums, the Pilot in Command shall use his/her discretion in whether to abort the flight and return to Rogers Helicopters, Inc. or continue the flight under Instrument Flight Rules with currently qualified personnel and approved aircraft." As part of its safety management system (SMS), Rogers Helicopters used its Flight and Ground Risk Analysis Program to identify the risks involved for a flight. The company's SMS manual stated, "Rogers Helicopters will determine an acceptable level of risk for its flights based on the type of operation, environment, aircraft used, crew training, and overall operating experience. When the risk for a flight exceeds the defined acceptable level for Rogers Helicopters, the flight will be further evaluated, and risk decisions made by appropriate Rogers Helicopters leadership." As part of this program, pilots complete a risk assessment worksheet before a flight to determine whether the flight would be low or high risk. The worksheet included specific factors related to flight operations, and a numeric value was derived depending on the factors that were identified for a flight. A flight had to automatically be declined if the numeric value was 17 or higher. The risk assessment worksheet completed by the accident pilot noted that the flight would occur at night and would involve a "scene call" (dynamic factors). Also, the "new pilot" box (static factor) and the "rested 4+ hours" box (risk reducing factor) were checked. In addition, the pilot noted that the highest obstacle would be at 1,293 ft, visibility would be 10 miles, and that he was "healthy, rested and fit for duty." The risk assessment worksheet identified a risk factor of 7 for the flight, which was below Rogers Helicopters' "decline factor." According SkyLife's SOP manual, pilots are required to undergo initial and recurrent qualification training to use NVGs. As part of initial training, 7 hours of ground training and 5 hours of flight training were required. The accident pilot had completed 0.78 hours of NVG training. 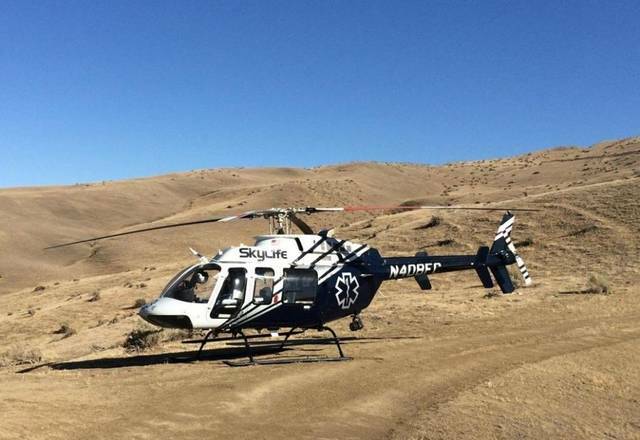 On December 10, 2015, about 1908 Pacific standard time, a Bell 407, N408FC, was destroyed when it impacted terrain during cruise flight near McFarland, California. The helicopter was registered to American Airborne EMS, Fresno, California, and operated by Rogers Helicopters, DBA SkyLife, under the provisions of Title 14 Code of Federal Regulations Part 135. 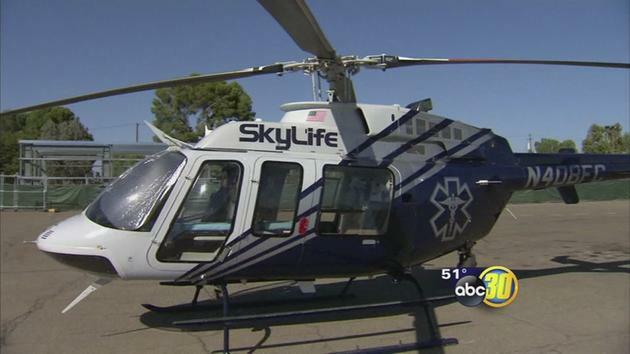 The Air Medical Flight call sign was SkyLife 4. 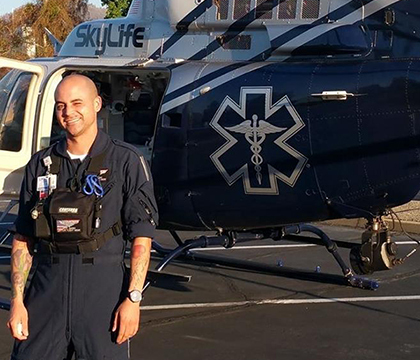 The commercial pilot, flight paramedic, flight nurse, and patient sustained fatal injuries. Visual meteorological conditions prevailed and a company visual flight rules (VFR) flight plan was filed for the flight. The cross-country flight originated from the Porterville Municipal Airport, Porterville, California, at 1851 with an intended destination of the San Joaquin Memorial Hospital, Bakersfield, California. Information provided by the operator, Federal Aviation Administration (FAA), and local law enforcement revealed that the helicopter was initially dispatched from Visalia, California, to Porterville to facilitate transfer of a patient to a hospital in Bakersfield. At 1918, a dispatcher radioed the pilot to confirm their status; there was no response. The dispatcher inquired with the destination hospital, and personnel at Bakersfield Meadows Airport and verified the flight had not reached the intended destination. Shortly thereafter, law enforcement personnel began a search near the last known location of SkyLife 4. The FAA subsequently issued an Alert Notification (ALNOT) at 2034. The wreckage was later located by local law enforcement air units at 2054. Examination of the accident site revealed that the helicopter impacted open hilly terrain about 9 miles east of McFarland. All major structural components of the helicopter were located within the wreckage debris path, that was about 465 feet in length, and oriented on a heading of about 037 degrees magnetic. The wreckage was recovered to a secure location for further examination. The Porterville Airport Location Identifier is KPTV. I've flown there many times.